It shows unknown adaptor type or not charging due to wrong id detection in windows. 4. Battery ID bat_id signal (this signal is for battery identification to describe battery type and a number of cells used in battery .it goes to charging ic pin no.20 (cells). 6. 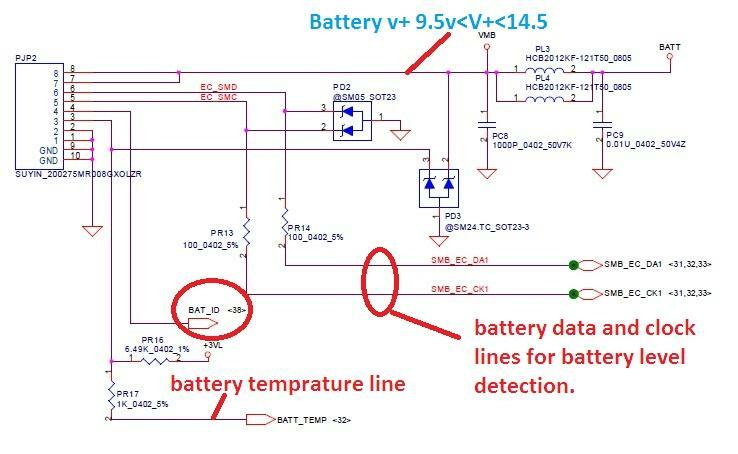 Battery SMBus data signal ( it transfer data between I/O pin no.78 and battery for determining how much battery is charged. It is responsible for making fstchg signal high to enable charging if the battery is low from it full condition. 8. Battery V+ same as pin no 7. Batt_temp pin no.3 is for battery identification that battery is connected and in good temperature.it is below 3.3 v for detect battery. If it is 3.3v no battery detect. 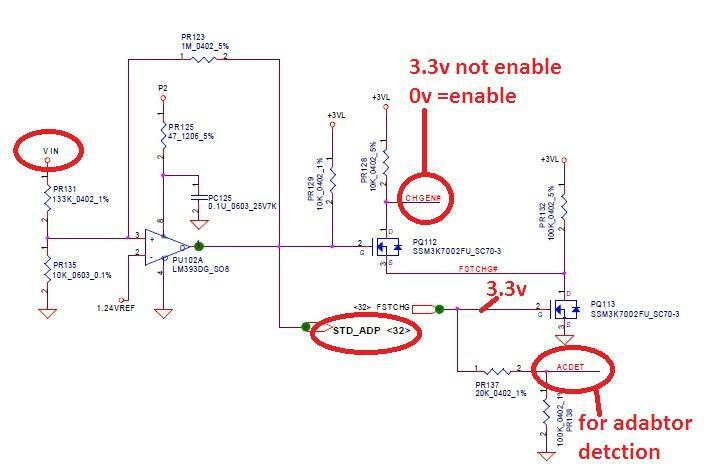 For battery level ec_smd and ec_smc signals are responsible it should be at 3.3V always. When acdet is above 2.4v charging ic detect a valid adaptor for charging.PQ113 gate gets fstchg signal it switches down to low chgen# signal for enabling charging. Charging condition available. There is another output on region pin no.24(6v) for boost battery charging. For adaptor current sensing Charging ic gets input to internal comparator from pr102 at ACP pin no.3 and ACP pin no.2 which compare difference and output ADP_i pin no.15, it goes to I/O pin no.65 AD input. I/O output ACSET from pin no.72 for set adaptor current set pin no.6 of charging ic. 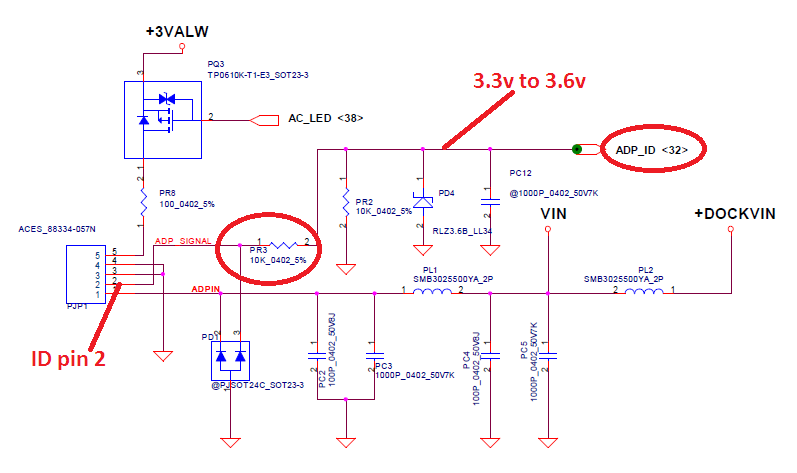 VDAC pin no11 is connected to 3.3v always for reference input for vadj pin no 12 by voltage divider set charge voltage. It is between 2.4 to 3.6 v idle. Charge current is set by SRSET pin no.16 by the external voltage from I/O Iref signal. 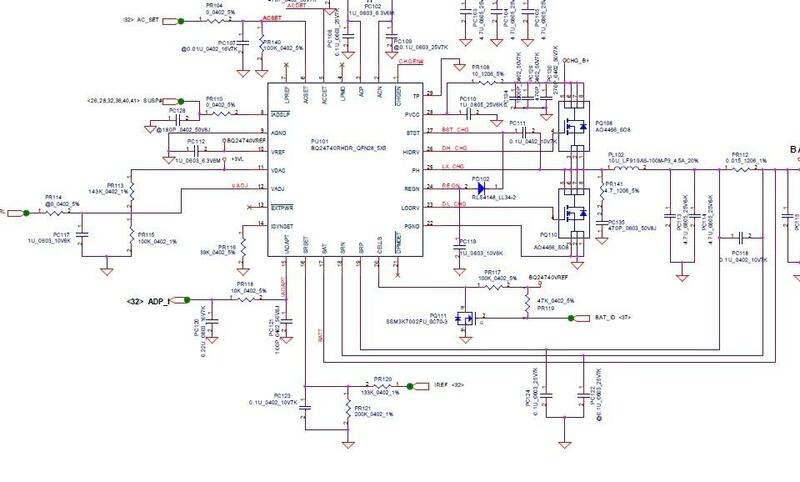 Charging is enabled (chgen# =0v) charging ic makes output on the gate of high side MOSFET PQ108 and on the gate of low side MOSFET PQ110 for charging voltage produce on pin no 25 (ph) through pl102 to the battery. Voltage through pr112 to battery and charge battery, charge current and voltage difference id detects by SRP pin no.19 and SRN pin no.18 .when SRP and SRN have true(SRP>SRN) IC regulate the charge MOSFET gate. When SRP=SRN it stops output on hdrv and ldrv to stop battery charging. it is battery over-voltage condition when the battery is charged up to 104% (detect by BAT pin no.17) it stops charging .it never start again until battery falls down to 102%.